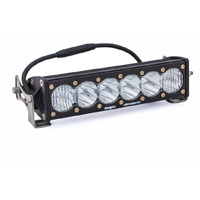 The OnX6+ LED light bar by Baja Designs is guaranteed durable for any off-road adventure. 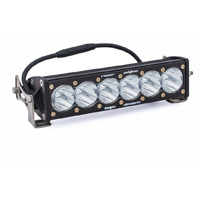 The OnX6+ is available in five unique configurations (OnX6+, Racer Edition, Arc Series, Arc Series Racer Edition, and Dual Control Series). 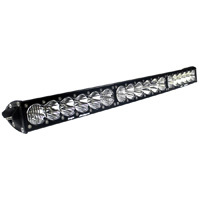 Compatible with most aftermarket mounting systems, the OnX6+ LED light bar adopts industry standard sizing and is available in 10", 20" 30" 40" and 50" sizes. An industry first 30 Day Satisfaction Guarantee & Limited Lifetime Warranty is included for the ultimate in purchase protection. 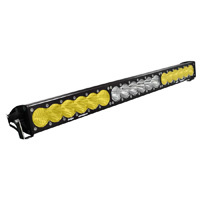 OnX6+ Racer Edition - 6,450 lumens per 10" section - Engineered for speeds over 110 mph. This bar will shine 40% farther than the standard OnX6+ bar. OnX6+ Arc Series - All of the features of our straight OnX6+ bars, but with a bend to match the lines of your vehicle. OnX6+ Dual Control - Dual power cord and dual switch. Control the ends of your bar separately from the center sections, for the ultimate in versatility.